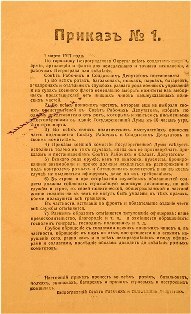 Amid the February events, the Petrograd Soviet issued its famous ‘Order Number One’ aimed at democratizing the army by electing soldiers’ committees. The new law also demanded that troops submit themselves to the authority of the Soviet ‘in all political matters’. In practice it meant that the Soviet had now control over the garrison troops of the capital. Soon the application of the decree was spread to rank-and-file soldiers even at the front. Soldiers began electing soldiers’ committees or ‘Soviets’, which reserved the right to reject officers’ orders. This reduced the authority of officers and thus weakened the Provisional government’s control over its armed forces. Military discipline was further undermined by the ending of censorship, which led to the increase in anti-war propaganda within the army, and by the Provisional Government’s decision to abolish the death penalty at the front. The structures of the new, largely working-class, machinery of power developed at an astonishing speed. Within weeks Soviets sprang up throughout the country. In June at least 350 local Soviets sent their representatives to the first All-Russian Congress of Soviets in Petrograd. The Petrograd Soviet now presided over a network of the local bodies, reaching across the entire country. In the spring, this new administrative machinery was still ill-organized and unreliable, but it ensured that the Soviet had more real power than the Provisional Government. At this stage the Soviet could have seized power on its own if it had wanted to. Most socialist leaders, however, believed that Russia was not ready for a socialist revolution. They remembered that even Marx had warned against trying to build socialism before all the necessary preconditions had matured. They argued that the Soviet democracy was too young and inexperienced to claim government authority in the desperate conditions of war and disintegration. The Soviet had therefore to entrust the power to its class enemy, the propertied elements, which had the skills and experience necessary to keep the economy running. The bourgeois government would continue to rule the country and direct the development of capitalism for a long period. In the meantime the Soviets of Workers’ and Peasants’ Deputies would master the technique of administration from the bourgeoisie. In addition to these ideological arguments for restraint, psychological factors may have been equally important. Most socialist leaders came not from Russia’s working classes but from the intelligentsia. Only seven out of the forty-two members of the Soviet’s first Executive Committee were workers. The rest were intellectuals. Despite their radical political beliefs, they shared the culture and outlook of Russia’s upper classes and feared that a working-class revolt in backward Russia could lead only to anarchy. Most socialist leaders also remembered the lessons of the 1905 Revolution, when the unrestrained agitation of radical intellectuals was partly responsible for the ill-prepared December insurrection in Moscow, which ended in bloodshed. ‘Dual power’ was an uneasy coalition of ‘bourgeois’ and working-class institutions, claiming to represent both Russia’s traditional elites and popular masses. It recreated the fragile alliance of the upper and lower classes that had nearly brought the tsarist government down in October 1905. In principle, the coalition of the Provisional Government and the Petrograd Soviet had enough popular support to create genuinely democratic institutions for the first time in modern Russian history. However, the political and social antagonisms between upper classes and working classes proved insurmountable. Their alliance grew shakier with each day and was finally blown up in October when the Bolsheviks seized power.